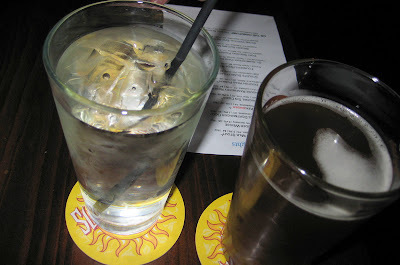 I wanted to go back to South Philadelphia Taproom ever since the first time I went. I dragged J there on a quiet tuesday night. There weren’t too many people there, so we had our pick of tables. We didn’t get to pick the super low table in front, as it was already occupied. We tried a few beers. Our server was beyond nice, and actually from Ireland, and happily brought us free samples of the beers without us even asking. To tell you the truth, I think he had a little man-crush on J. He didn’t bring me any free beer. J got the burger. Look at that beautiful and giant yellow tomato. The burger came with mustard already on it. Lucky for J, he likes mustard, and he liked the burger. If I had ordered the burger, I would have been livid. 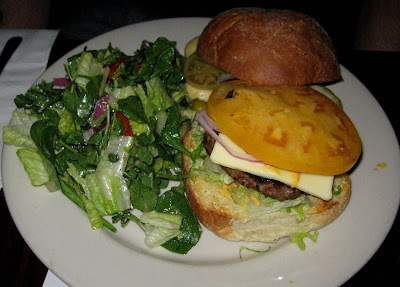 It came with a side salad and a bunch of pickled veggies – cucumbers, mushrooms, and tomatoes. They were a bit on the spicy side, and I liked it. 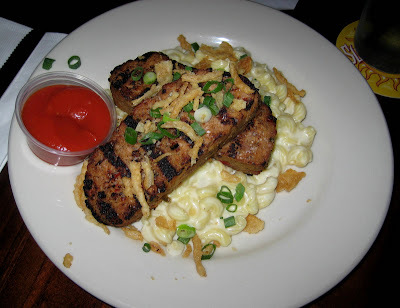 Of course, I got the meatloaf entree, which comes on top of mac and cheese. It was still as good as I remembered. The meatloaf has a nice grilled flavor from the char marks. And the mac and cheese is so super mild and delicious and creamy. And the homemade ketchup just makes the dish. It’s different than store-bought ketchup, but perfect for this meatloaf and the mac and cheese. I really should branch out and try other things on the menu here. I guess it’s an excuse to go back!